A press release is a short, official declaration of important developments for the attention of the press, journalists, and media outlets. The traditional purpose of press release writing is for businesses to use them part of a broader campaign, to recruit journalists to their cause, and generate media coverage for their business. This, however, is just the tip of the iceberg. When press releases were popularized, we lived in an analogue world. In the digital realm, press releases have evolved to confer many more benefits to businesses than they ever did before. As of right now, press releases are one of the most influential and impactful forms of distribution you can get. Distribution. That’s an essential advantage to press releases. There are whole expansive networks dedicated to proliferating this kind of material across the web, including on some of the most authoritative brands and domains in the world. Today, brands face a ‘content crunch’ – unable to produce enough high-quality content at with enough of a turnover rate to retain and build their audience in a saturated, competitive environment. Press release networks circumvent this problem for you by distributing your piece of content to networks around the globe, amplifying its impact exponentially. Press releases can do this, and so much more for your business. First, we’re going to look at exactly what a press release can achieve for you. Then, we’re going to look at real life case study of a PRWIRE Asia customer who had extraordinary results using press releases, so you can see all this theory in action. One of the best things about writing a press release is that the well-established infrastructure you can benefit from, almost immediately. As soon as your press release is approved it can be distributed hundreds of different news sites and media outlets – thanks to the digital age, this process can be completed in moments. If I told you there was easy way to get your messaging across hundreds of high authority, trusted domains including sites like Reuters, CBS News and ABC, you’d be insane if you didn’t jump at that chance. Well, Press Releases give you that chance. This is because news and media brands have spent years creating distribution networks and syndication agreements that they all benefit from being a part of. Maximizing exposure for your business was never easier. This increased exposure also has the potential to resonate even more if your messaging is picked up and featured by a journalist. Journalists are trusted influencers in the modern online environment and their readership are used to taking actions based on their recommendations. What’s more, an increasing number of people are now reading news sites with greater depth than ever, meaning people can go straight to the newswires themselves and find out about the stories they care about. Both these effects mean distributing press releases is a powerful way of increasing the number of leads who visit your website, thereby increasing the chances of making sales. So you’re starting a new marketing campaign! Great. A press release is the most condensed, crystallized form of messaging you can create – you have to get all the important information, significance, implications and perspectives across in the shortest time possible. This means just creating a press release will you nail your messaging and what’s really important. Media sources view a press release around 275 times in a week according to Dan Zarrella’s research by Hubspot. What’s more, a great press release will have an image or a link to video content, which massively boosts engagement. Creating this material will also allow you to utilize it elsewhere. Sure, you’ve thought about targeting consumers, but what about industry? You know who loves talking about marketing? Marketers. Designers. PR consultants. Entrepreneurs. They have their own magazines, trade papers, and websites all dedicated to covering developments in marketing. These are read by people in professions you probably draw on at work. There are many more out there who work for other companies, and when they leave the office, they become consumers, just like anyone else. They carry the brands they love, brands that respect marketing, design and messaging, home with them. Talking about your marketing from an industry perspective can help you get distribution in specialist media outlets, and this in turn can help you expand your reach in avenues you never expected. Just look at Muji’s Tokyo store being showcased for its design. Distribution to high authority domains with significant information – especially if you are sharing data, research, innovative new products or useful resources like infographics – will help you establish your business an authority in its field. Being able to tell consumers that you have featured on Southeast Asian news networks together with international news sites like Google News, CBS and NBC is a shortcut to establishing the significance of your company, which means people are far more likely to trust you. Media coverage is a form of endorsement, and will give you credibility and a platform to become a leading light in your field. The more touchpoints you find your brand represented on, the more chances you have to be discovered by customers. In real terms, Press Releases increase traffic to your website by increasing the number of backlinks you can be discovered from. Think of it this way – are your potential customers more likely to type your URL into their browser out of thin air, or follow a link from their trusted, regularly updated news source? Following on from the above, SEO and Press Release distribution go hand in hand. Search Engine Watch has published a detailed study on how the two work together to throw weight behind your website, with backlinks from high authority domains. PR specialists understand that SEO is just a technical way of making sure audiences get their eyes on messaging. As such, SEO needs to be an integral part of any public relations campaign. Press Releases are a powerful form of SEO delivery mechanism. Further developing the above – and it’s always good when benefits snowball into one another – more authority means higher rankings and higher rankings mean you are discovered by more people. Discovery from more people means you are introducing your brand to people who never knew about you before. Being introduced to new audiences is an essential part of growing your business – there’s only so much customer lifetime value can yield. Eventually you need new customers, and PR can help you get them. A great Press Release can capture the imagination of journalists, who in turn inspire people to discover more about what your business is doing. Many people wonder why press release writing is such a focus for small businesses. Well, it might take a single hour to write, upload and distribute your press release. This is one piece of content that is now proliferated to hundreds of news sites, each with their own audiences. As a result, press releases punch far above their weight. There is no other way to get as much traction from a single piece of content as through press release distribution. If you are looking for bang for your buck, getting a professionally written, compelling press release distributed across a network of high authority, locally and internationally optimized websites will deliver over and above any other piece of content you could name. That’s all great, you say, but can we prove it? Well, actually, yes we can. The Havson Group is a VR entertainment technology startup. They are pioneering the introduction of Virtual Reality gaming in Southeast Asia. The Havson Group recently launched EXA Outpost, a first of its kind hyper-reality development studio based in Kuala Lumpur, Malaysia. Here, players can leave reality behind and immerse themselves in a first-person experience that puts players in the middle of a new world, and enables them to explore other dimensions. The company has a great product and an announcement that is current, important and significant. It’s a great start. The company even received investment from 500 Startups recently. Even better. 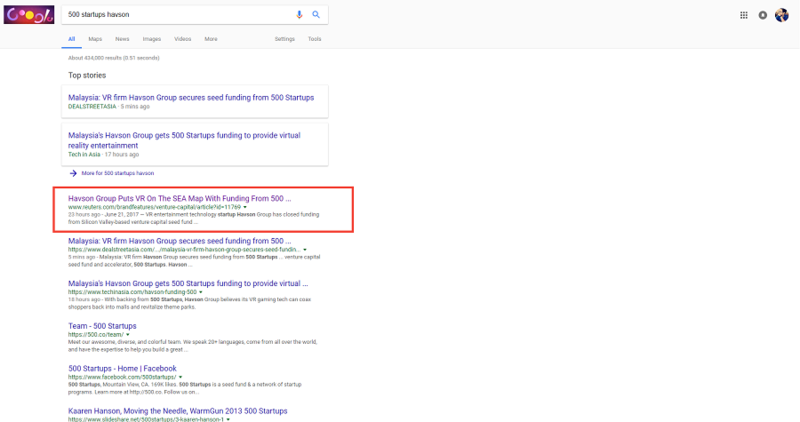 So why, when you look for the targeted keyword “Havson 500 startups”, this happen? 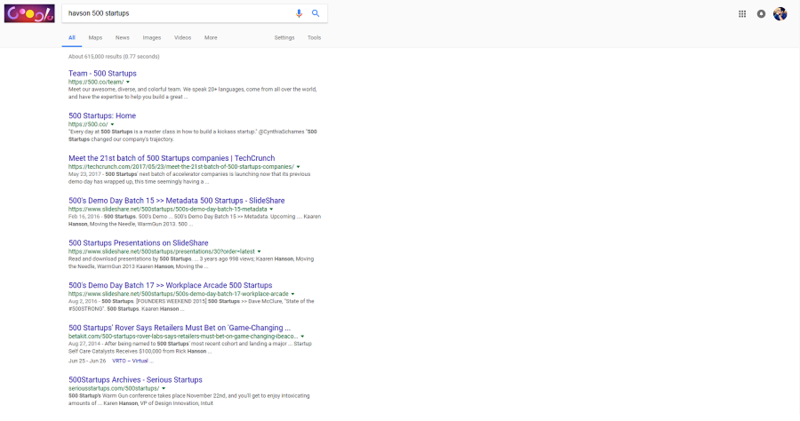 Not a mention of the company anywhere on the first page, and their name is in the keyword. Bear in mind, while you might be astonished to see this, it’s probably happening to your company in a whole host of different situations. This is surprisingly common. Unless you tell the press about it, Google won’t know about it either. So, Havson Group identified this problem and set about trying to fix it. They wanted the fact that 500 Startups had invest in them, in order to attract further investors, early adopters and other important core audiences. They then use PRWIRE Asia service to maximize the distribution of their new messaging, which prioritized the 500 Startups investment and the launch of their virtual theme park. The press release was distributed in accordance with their preferences. As well as introducing the concept to so many new audiences and influential journalists, the targeted PR distribution across Southeast Asian news networks also had a tangible benefit to the company’s SEO strategy. Havson Group transformed their visibility on search engines through the use of press releases. Beforehand, the company didn’t even rank on the first page for their own name. Now, they dominate five of five of the top results, with high authority local and international news sources like Reuters and Tech In Asia coming top of the pile. As a result, company instantly looks like one of international significance, with the power to make a significant change to the gaming industry in Southeast Asia. Our professional writers have drafted thousands of press releases for companies, and the most common feedback we receive is that the company’s we work with feel that this distribution has helped to legitimize their business. Most SMEs are built out of a passion and a desire for a product or a service, not out of a passion for marketing, accounting, recruitment and all the other things required to make a business succeed. By outsourcing their PR requirements to us, SMEs have seen extraordinary value for money, changing not only how the public sees their business, but how the business owners themselves see their business as well. So, there we have it. 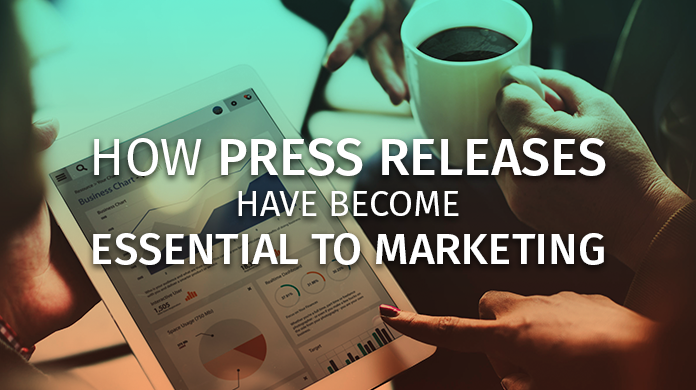 We’ve shown you the benefits of press releases, and how businesses are out there right now making the most of those benefits. PRWIRE Asia is here for one reason only: to help ASEAN businesses get those same benefits. The company offers full spectrum PR distribution, support and consultation, with a proprietary Continuous Communication Cycle designed to maximize the long term impact and audience development of your campaigns. Now you see the power of press releases, are you ready to send one for your business? But hey, if you’d prefer to go it alone and do it yourself, have a look at this tool — PRShelf. It has thousands of press release templates for you to use to ensure you create a high-performance, optimized and compelling press release for your business. If you have a press release success story you’d like to share, please post it in the comments below!